North western Islay has become rather more frequently visited since the establishment of Kilchoman Distillery placed it on the itineraries of all those coming to the island to visit its distilleries. Despite this, the area remains less well known than it deserves to be. Whether or not you are into distilleries, and if you are visiting Islay you probably are, Kilchoman is well worth visiting for another reason. Half a mile south west of Rockside Farm, home to Kilchoman Distillery, is the ancient settlement of Kilchoman. This was once the focus of a large community living in this part of the island, but depopulation through clearance and emigration in the latter half of the 1800s means that little now remains beyond some scattered houses and cottages. Plus the reason for seeking it out, the ruins of Kilchoman Old Parish Church; the fine stone cross in its churchyard; the nearby military cemetery; and a second stone cross (just about) standing in a field near the cemetery. The shell of Kilchoman Old Parish Church dominates Kilchoman today. It is not a pretty ruin, comprising a tower and a grey harled shell with blocked up doors and ground floor windows: and the remains of the roof still occupy the interior into which it has collapsed. Until 1977 Kilchoman Church was the parish church for a large part of north western Islay. But by then the area had become largely depopulated and the church was abandoned, with St Kiaran's near Port Charlotte serving as the focal point of the parish instead. The churchyard and neighbouring more modern cemetery remain the main burial ground for this part of the island. Kilchoman Old Parish Church was built in 1827 to help serve a population which across Islay as a whole peaked at 15,772 in 1841. The population had halved by the end of the century and has halved again since, and those who live on Islay now tend to do so in the main settlements rather than in the rural areas. The church whose ruins remain today replaced a medieval church, which served a large parish with support from dependent chapels at Kilchiaran, Kilnave and Nereabolls. This earlier church appears to have been built in the mid 1300s, though it in turn probably replaced an early Christian chapel. The medieval church was declared unsafe in 1824, and replaced by what is now known as the Old Parish Church. Nothing remains of the medieval church, but the surrounding churchyard still has a wealth of evidence of its presence. 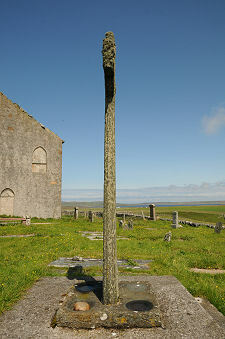 Most striking is the Kilchoman Cross, which can be found in the churchyard just to the south east of the church. This stands some 2.57m high by 0.97m across the arms and was carved in a style known as the "Iona School" at some time in the 1300s or 1400s. 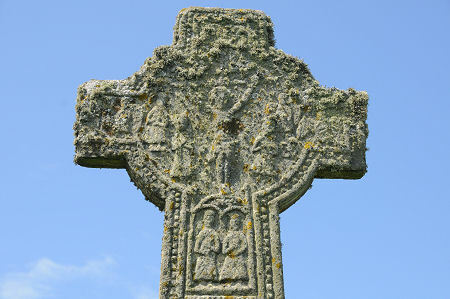 The carving on the cross is magnificent, and remains remarkably crisp despite the efforts of the local lichen population. The east face of the head of the cross carries a depiction of the crucifixion with Christ surrounded by saints including St Mary, St John and St Michael. The side arms of the cross are decorated with carved angels. Amongst the other carvings on the cross are two figures, thought to depict the man who paid for the cross to be carved, and his father, who was among those it commemorated. Part of the shaft carries an inscription in Latin which translates as: "This cross is by Thomas, son of Patrick the doctor. It is for the souls of his father, his mother and his wife, and the souls of all the faithful departed, and of the said..." at which point it seems to run out of space. Thomas and Patrick are thought to have been members of the Beaton family, who were physicians in the parish. Nearer the foot of the cross shaft is a carving of a horseman, probably engaged in a hunt. 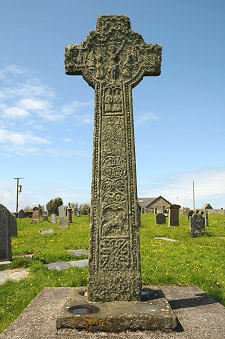 The west face of the Kilchoman Cross is largely given over to decorative carvings in the form of complex interlocking patterns. One of the most striking things about the cross is how thin it is when seen from the side. 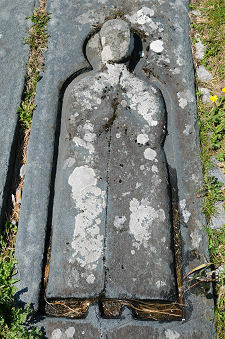 Nearby in the graveyard are a number of fine early grave slabs depicting effigies of priests or knights. A slab with a deeply incised carving of a priest is especially impressive. Some of the other carved stones found in the surrounding area are now housed in the Museum of Islay Life in Port Charlotte. 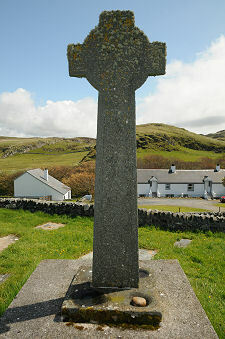 One that can still be found in its original location is known as Kilchoman No.2, and can be found in a field 330m south west of the church, fairly close to the Kilchoman Military Cemetery (see below). This is a cross slab that stands some 0.95m tall, or would if it did not lean at a fairly acute angle, by 0.4m wide across the cross. It is generally believed to date back to the 800s, and to have been erected here as a sanctuary cross, helping mark out an area within which fugitives would be protected from their pursuers. The heavy lean gives the stone a rather forlorn feel today. The setting, in a slight hollow apparently filled with stones, left us wondering whether it might originally have marked a holy well. 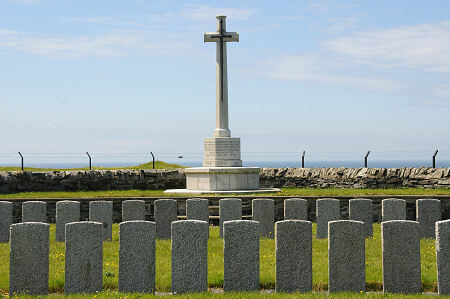 The nearby Kilchoman Military Cemetery is the final resting place of 71 of the British crew members who died when H.M.S. Otranto sank in Machir Bay, the bay the cemetery overlooks, on 6 October 1918, following a collision in poor weather. Three other seamen are also buried here. Many of the 351 American soldiers who also died in the tragedy were originally buried here in groups of 20, until their bodies were repatriated in 1920. H.M.S. Otranto is one of two ships whose losses were commemorated by the erection of the American Monument on the Mull of Oa after the war. Amongst those buried at Kilchoman is Captain Ernest George Davidson, the captain of H.M.S. Otranto.